Hi. It’s Kelli again, it’s February 28th and this is Thought #12. My final thought for you for February. Thanks, Sarah, for inviting me to do this, it’s been the most extraordinary and eye opening experience to have this responsibility to you all three times a week, to share my thoughts. I’m honoured to have been asked. I began this month talking about the depression I was in the midst of, so I want to end this month talking about the depression that I am now rising out of. This is what they call Season Affective Disorder, and for anybody who’s ever doubted it, that’s a thing. That’s a real thing. I and hundreds of thousands of other people who live in northern climes contend with this every single year. And every single year it takes me by surprise, and every single year I am laid indescribably low by it, and every single year through some mysterious process that I am not really in control of it begins to lift. As the light returns to the sky, and as the warmth returns to the air. And it doesn’t hurt to be busy, and to be engaged, as I am now, in projects that I am passionate about, and it really doesn’t hurt to be … to find myself now, back in Calgary. Which, for my money, as I just finally discovered at this late date last year, is one of the warmest and most beautiful theatre communities in this country, and I’m delighted to be here. And, um …. I think, it’s important that we remember, those of us who contend with this, because when you’re in the midst of it, it’s really hard, but it’s important to remember, that it will pass. The light will return, the spring will come. Hang on. And as a very dear, and very smart friend of mine once said to me …. Fresh air and forward motion, it’ll cure everything. I believe that’s true. Hi there, it’s Kelli, it’s February 27, and it’s 8:30 in the morning, and I’ve just realized that I spent my whole day yesterday so buried in a Hamlet edit that I forgot all about you! The good news is, life is incredibly busy, and there are lots of projects on the go, and uh … I find myself once again apologizing. So I’m sorry, I hope your February has been fantastic, mine certainly has. Heading into my last week on Lonely Diner rehearsal, and loving the company here in Calgary, and enjoying things. Here comes the spring! Yeah! Depression lifts. Hi, it’s Kelli again, it’s February 22, and this is thought # 10. And, ok, this is a little weird, little random, but here goes. I happen to have a somewhat famous sibling. And about 30 years ago there was an event involving myself, and this famous sibling, and the National Enquirer. And weirdly, randomly, the National Enquirer has been in touch with my agent, and let her know that they would like to re-visit that piece, they’d like to follow up on the lies they told 30 years ago, and they’d like to know if I would like to contribute a few thoughts. The short answer to that is no. Thank you. No. But it’s had me thinking all day about the fact that that event was the beginning for me, that planted a seed of my deep, deep distrust of celebrity culture. It’s a large part of the reason that I chose to remain in Canada, on stage, where I could just do my work and not have any of those weird distractions. But more importantly than that, there’s a thing about celebrity culture that really makes me kind of puke. I can’t stand the fact that people can’t seem to be in a room with someone who was on television, and be themselves. I can’t stand the fact that a little bit of celebrity profile seems to add extra weight, and probity, and value to every word that drops out of a persons mouth. That culture put Donald Trump in office in the United States. And I would hazard a guess that that culture played a large part in putting Justin Trudeau in office in Canada. Celebrity culture is not our friend, and we have to get over it. That’s what I ‘m thinking about today. Hi, it’s Kelli Fox again, it’s February 21st, and this is thought # 9. And today, I really can’t stop thinking about those kids in Florida. I can’t stop thinking about their bravery, and their unbelievable strength, in the face of political apathy, and obstruction, and obstinacy from the adults around them. I’m so, so impressed with them. And today I learned something about them that I didn’t know before which is that they mostly know each other through the theatre group at their school. Those kids are artists. And it kind of kills me …. but it affirms something that, of course, we all know. The theatre, the arts, teach empathy. They’re vital in our schools. That’s what I’m thinking about today. Hi, it’s Kelli again, it’s February 18th and this is thought #8. And thought # 8 is about this amazing little thing I got to witness this afternoon. I’ve always heard about Lunchbox Theatre in Calgary, but I’ve never been able to see anything there, and I saw a play this afternoon … at Noon … an hour long. It was a play, really at bottom it was a play about coming out, it was also a little bit a play about culture clash, very much a play about family, full of heart, full of love, and depth, and hilarious. and about an hour long …. and, I swear to god, people leave their office buildings, all these towers in downtown Calgary, and they come down there, and they look for a different kind of nutrition on their lunch break. And I think that’s amazing! And I congratulate Calgary for making that happen, and I congratulate Calgarians for keeping it alive. Hi. It’s Kelli again, it’s February 15th and this is thought #7, and what I am thinking about today, what I’m wondering about today, is whether or not there is any such thing as social progress. I found myself in rehearsal today, listening to the words coming out of Al Capone’s mouth in the play, and for all the world, all I could hear was Donald Trump. It was extraordinary. I was a teenager, and a young woman, in the late 70’s, early 80’s, and I knew for certain that I lived in a different world than my mother had. I grew up in a different world, even than my older sisters. And what all of us knew for sure was that we were never going back to that old world. The forward march of social progress was irreversible, and irresistible, and we were embracing it. And sometime around the late 90’s, turn of the century you just started to feel this pull, this drag on that forward progress, and then that drag began to feel like an actual reversal. And now we live in a world where Donald Trump is President of the United States, and it just makes me think, what have we been doing for the last hundred years? We’ve circled right back around. Is there any such thing as social progress? Hi. It’s Kelli Fox, again. February 14th. Valentines Day. I’m not going to talk about that. That’s not going to be thought # 6. Thought # 6 is about beginnings. We started rehearsal yesterday for my next project which is Lonely Diner at Vertigo Theatre in Calgary. And, oh there is something about beginnings, man. There is something about a blank slate, a clean fresh white sheet of paper, an empty room with a bunch of people, some words on a page, some tape on the floor, a few scattered props and bits of furniture around the room, and out of that we are going to begin to build a story. And that is exciting. That’s a great day. I always love this day. So that’s what I’m thinking about. It’s early in the morning on February 13th, it’s Kelli Fox, and this is Thought Residency #5. And I guess this morning it’s all about focus. I flew to Calgary on the weekend, I’m about to start rehearsal today, it’s my sister’s birthday today, and it’s all been a bit um … distracting and overwhelming, and I forgot to put this together for you. Um, because my focus is a bit chaotic and askew. I guess that’s what I’m thinking about this morning. Pulling it together. Hi, it’s Kelli again, it’s February 8th today, and this is Thought #4. Which today is all about light. The light, the light, that creeps just earlier, and just a little earlier, and just a little earlier every morning into my room, and it let’s me know that spring is just around the corner, and even though I’m on the prairie and everything is still frozen solid here, and it will be for … ….. weeks, it’s gonna be ok, because the light is coming. The light is coming. And it just has a way of turning everything. Praise to the Light. That’s what I’m thinking about today. Hi, it’s February 7, it’s Kelli Fox again, and this is thought #3. So, I was at the theatre yesterday morning for the first day of rehearsal for the company of US. New Canadian musical, everybody’s pumped, tons of excitement in the room. And Wes Pearce, the designer, was giving his presentation, he’s talking about how they got where they got with it, and he just happened to mention, in passing, that this project might push some boundaries for some people here. He didn’t make a big statement, but he reminded everyone that what they were about to embark on was risky, and it was like everyone’s nerve endings came alive. There was this kind of collective inhalation of kind of giddy, terrified anticipation, because, of course, it’s what we all live for. Our work might matter enough to cause a bit of a stir in town, get people talking, get them angry, or get them animated. Alternatively, we could bore them. But we don’t know until we take the risk, and for some reason, for a lot of us, the scarier the proposition, the bigger the risk, the more irresistible the challenge. I’ve heard so many of my friends say, “I had to say yes, it scared the crap out of me.” It’s like the opposite of risk aversion. Risk perversion. That’s what I’m thinking about today. It’s February 6th. It’s Kelli Fox, and this is thought #2 for my February Thought Residency. And today I’m thinking about time. I’m thinking about time as a commodity, as the most valuable commodity we have, each of us, in life, but also, … we, as artists. Once we’ve begged, borrowed, or stolen whatever it takes to make our art, that will speak our truth (and let’s not forget that is what it is that matters), once we’ve bought that time, we have a responsibility about how we use that time. That’s what I’m thinking about today. Hi. This is Kelli Fox. It’s February 1st and this is the beginning of my Thought Residency and here’s my first thought. Um … I’ve been thinking a lot this past couple of weeks about the healing power of our work. As I make my way through another dark Canadian winter and battle the depression that hits me every year at this time, I am grateful for the studio that I go into every night right now, and the guys that I’m working with on this project that’s teaching me things, and stretching my own practice, and healing me, inside, every time I go into the studio. And I’m grateful for that. That’s my thought today. 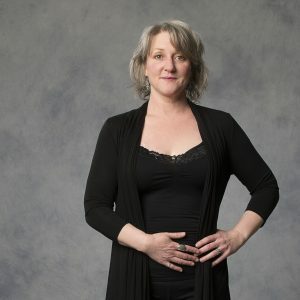 Kelli Fox is an actor/director with more than 30 years experience on stages across Canada, and in the US, including 13 seasons with the Shaw Festival, and 3 seasons with the Stratford Festival. Last season she joined the team at Globe Theatre as Artistic Associate. Directing credits include The Drowning Girls, Hound of the Baskervilles, Peter and the Starcatcher, A Christmas Carol (Globe), Kitchen Radio (Blyth Festival), The Nerd (Victoria Playhouse, Petrolia), Boston Marriage and Man to Man (Headstrong Collective), and This Wide Night (Summerworks 2013). Upcoming: I and You at the Globe, and Beverly Cooper's The Lonely Diner at Vertigo. Kelli has been recognized with a Jessie award (Keely & Du, Arts Club/Canstage), a Dora nomination (Top Girls, Soulpepper), a Capitol Critics Circle award (A Room of One's Own, Shaw tour), a Toronto Critic's Circle award (Penelopiad, Nightwood Theatre), as well as sharing a Dora with the Penelopiad ensemble. She was the 2016 recipient of the Gina Wilkinson Prize recognizing emerging directors transitioning mid-career.